SOUTHERN PINES, N.C., March 29, 2019 /PRNewswire/ -- Richard Moore, CEO of First Bancorp, will be recognized next month as the CEO of the Year in the "Larger Company" category at Business North Carolina's annual CEO Summit. 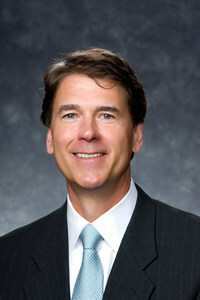 Moore joined First Bancorp—the holding company of First Bank, now the largest community bank headquartered in North Carolina—in June 2012. During his tenure as CEO, First Bank's total shareholder return was more than 375 percent, while the S&P 500 Index was up only 150 percent in that same time period (June 2012 to March 2019). Additionally, First Bank's market cap grew from $150 million to almost $1.2 billion. "I am honored to be selected as CEO of the Year by the team at Business North Carolina," said Moore. "It's been a pleasure to lead First Bancorp and shepherd its growth over the last 7 years. I look forward to what's ahead and to continuing to serve our clients and shareholders." Moore is a North Carolina native, having grown up in Oxford in Granville County, and attended undergraduate and graduate school at Wake Forest University. From 2001 to 2009, Moore served as the state's treasurer and was recognized as the country's Top Public Official of the Year in 2004 by Governing Magazine and profiled by U.S. News & World Report. In 2006, he was also selected for an Eisenhower Fellowship. "Richard has been the consummate champion for the company to its customers, associates, and shareholders," said James C. Crawford, III, chairman of the Board of Directors of First Bank. "It's no surprise that he was selected as one of the state's best CEOs given the unprecedented growth of First Bancorp's holdings, from its community bank to its acquisition of one of the nation's top SBA lenders: SBA Complete." The CEO Summit will take place on April 1 at the Carolina Hotel in Pinehurst (N.C.), and the award will be presented by Brooks Pierce. First Bancorp is the holding company for First Bank and is headquartered in Southern Pines, North Carolina, with total assets of approximately $5.9 billion. Its principal activity is the ownership and operation of First Bank, a state-chartered community bank that operates 101 bank branches in North Carolina and South Carolina. Since 1935, First Bank has taken a tailored approach to banking, combining best-in-class financial solutions, helpful local expertise, and technology to manage a home or business. First Bancorp's common stock is traded on the NASDAQ Global Select Market under the symbol "FBNC." S&P Global recently recognized First Bancorp as one of the top 20 community banks of 2018 with $3B to $10B in assets. Visit our website at www.LocalFirstBank.com. Member FDIC, Equal Housing Lender.